Because sharing is caring. Here are my notes after tons of reading and lab time. 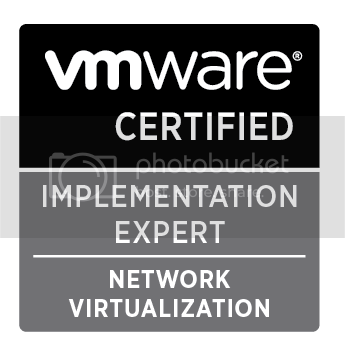 Heavily using the VCAP5-DCA Official Cert Guide (OCG), the vSphere 5.5 Documentation Center. Supplementing with blogs and youtube anywhere my main sources fall short. Extra special thanks to Chris Wahl for his Study Sheets. They are helping me tons with managing my time. I’m using the VDCA550 version. VC > VM > Edit Settings > Add > Add the PCI device. – Only on VMs with RDM disks (VMs with reg disks use WWN of the Host’s HBAs. – vMotion supported; vmkernel reverts to physical hba if destination host ors not support NPIV. – Disabling and Re-enabling NPIC capability on FC Switch while VM running can cause FC link to fail and I/O to stop. – RDM is not available for directly attached block devices. VC > Host > Configuration > Storage > Add Storage… > Select Disk/LUN > Select Datastore > Mount options > Keep Existing Signature. No GUI method exactly matches the commands above. WC > Host > Manage > Storage > Host Cache Configuration > Select DS > Allocate space for host cache. * CMDS/s – This is the total amount of commands per second, which includes IOPS and other SCSI commands (e.g. reservations and locks). Generally speaking CMDS/s = IOPS unless there are a lot of other SCSI operations/metadata operations such as reservations. * DAVG/cmd – This is the average response time in milliseconds per command being sent to the storage device. * KAVG/cmd – This is the amount of time the command spends in the VMKernel. * GAVG/cmd – This is the response time as experienced by the Guest OS. This is calculated by adding together the DAVG and the KAVG values. As a general rule DAVG/cmd, KAVG/cmd and GAVG/cmd should not exceed 10 milliseconds (ms) for sustained lengths of time. The sum of reads and writes equals IOPS, which is the the most common benchmark when monitoring and troubleshooting storage performance. These metrics can be monitored at the HBA or Virtual Machine level. # Full copy – Array performs copies without having to communicate with the host. Speeds up cloning/svmotion. VC > VMs & Templates > New VM > In storage section, use the drop-down, the view will filter datastore options into compatible/non-compatible options. ■ Lazy-zeroed Thick (default) – Space required for the virtual disk is allocated during creation. Any data remaining on the physical device is not erased during creation, but is zeroed out on demand at a later time on first write from the virtual machine. The virtual machine does not read stale data from disk. ■ Eager-zeroed Thick – Space required for the virtual disk is allocated at creation time. In contrast to zeroedthick format, the data remaining on the physical device is zeroed out during creation. It might take much longer to create disks in this format than to create other types of disks. – File block zeroed when disk is created. – Fully preallocated on datastore. ■ Thin – Thin-provisioned virtual disk. Unlike with the thick format, space required for the virtual disk is not allocated during creation, but is supplied, zeroed out, on demand at a later time. – File block is zeroed on write. – File block is allocated on write. ■ rdm:device – Virtual compatibility mode raw disk mapping. ■ rdmp:device – Physical compatibility mode (pass-through) raw disk mapping. ■ 2gbsparse – A sparse disk with 2GB maximum extent size. You can use disks in this format with hosted VMware products, such as VMware Fusion, Player, Server, or Workstation. However, you cannot power on sparse disk on an ESXi host unless you first re-import the disk with vmkfstools in a compatible format, such as thick or thin. – automatic path selection algorithm, rotating through all active paths when connecting to active-passive arrays. – Host uses designated preferred path, if configured. Otherwise uses the first working path. An explicitly designated path will be used even if marked dead.